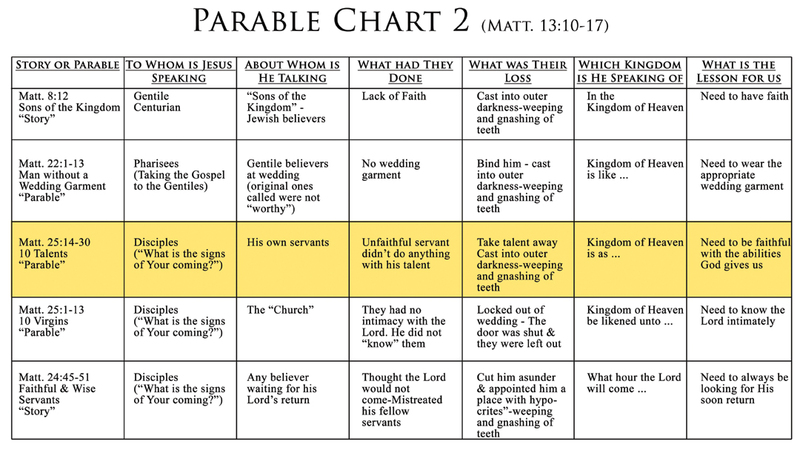 In our last newsletter, we examined in detail the terms “outer darkness” and “weeping and gnashing of teeth” in the Parable of the Ten Talents (Matthew 25:14-30). After reading our article, hopefully you came away with a new understanding of these terms and what exactly Jesus meant by them. So now, when you think about the “darkness outside” and the “profound remorse” that the non-overcomers will experience there, you are comforted that it is not “hell,” but simply a place of renewal and re-instruction. It’s important that we don’t allow the enemy to put fear and condemnation upon us. We must recognize the difference between conviction (which is from God) and condemnation (which is from the enemy). We must constantly remind ourselves of how much God loves us. And always remember that God does not punish His children. Yes, He chastens us, but He does so because He loves us and because He knows it’s for our benefit. Picture a young family going on a summer vacation in their SUV. They have three small children, two of whom have behaved perfectly the whole trip, but their third child has been incorrigible. The parents don’t throw that child out of the car into the dark night, never to see him again. They love him. And because they love him, they make him sit in the very back seat of the car until he acknowledges his mistakes. When he does so, again because they love him, they take the time to talk to him and retrain him in the right way to behave. This might be exactly what God is going to do with His dis-obedient children in the coming kingdom. Just like the parents did with their disobedient child, they first disciplined him, but then they took the time to restore, instruct and retrain him in the right way to act. God might do the very same thing with us! It’s called “tough Love.” It’s tough, but it’s still Love! That’s God’s way! That’s His character! And, that’s His methodology! This is exactly what occurred with the third unprofitable servant in the Parable of the Ten Talents (Matthew 25:14-30). Because he didn’t use his gifts in the proper manner, the master had to put him where he could be retrained. This brings us to our Parable Chart again. To whom is the Lord speaking? He is talking to His own disciples. About whom is He speaking? He is speaking about His own servants–the coming church. What had they done wrong? Some had not invested the talents that He had given them wisely. They had squandered them. What was their loss? They lost what they did have and were cast into the darkness outside, where they experienced weeping and gnashing of teeth. What occasion does this remind us of? Possibly, the future Judgment Seat of Christ. Where is this event to take place? In the future Kingdom of Heaven. What is the lesson for all of us? We need to be faithful with the talents and abilities that God has given each of us here and now. Remember the historical background here, at this point the “Kingdom of Heaven” had been rejected by the Jews and thus, Christ had just offered it to “a nation bringing forth fruits” (i.e., the church). 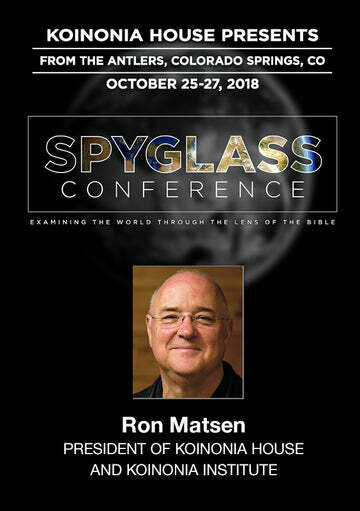 (Matthew 21:43) So, the focus is on a future nation who is supposed to bring forth “fruit,” but obviously, as with the third servant in this parable, some will not. 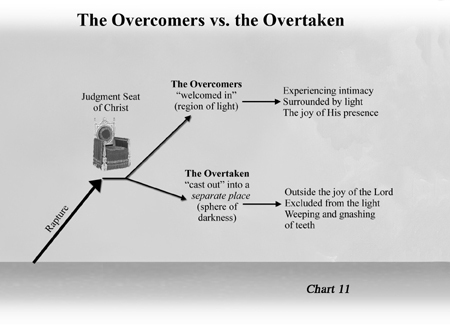 The bottom line is that at the Judgment Seat of Christ (which we will speak more about in the coming issues), the overcomers (the faithful believers who “bring forth fruit”) will be informed of their welcome into the region of Light, where they will experience the joy of the Lord. The overtaken (those nominal, lukewarm Christians who produce no “fruit”), however, will be informed that they will be cast into a sphere of darkness outside the light and joy of the Lord, where they will experience tremendous remorse and regret. Studying this subject of inheriting the kingdom and co-reigning with Christ in the Millennium has been such an in-credible eye-opener for both Chuck and I. It’s absolutely set the Bible on fire for us and illuminated every single page. We’ve both been Christians for over fifty years and yet, are only now getting the full impact of what all of this really means. But thankfully, it’s not too late! If you are reading this now, then it’s not too late for a renewed commitment! It doesn’t matter how badly you’ve blown it in the past; or what horrible things you’ve done or how many times you’ve have failed. In other words, one choice and we can be back on the road (God’s High Way) again towards becoming an overcomer! Overcomers are not “perfect.” They fail just like the rest of us, but they keep on getting up, keep on repenting and keep on being willing to surrender themselves to Christ and letting Him, who is the only “perfect One,” work through them. That’s His promise! That’s our hope! And that’s the tree of life! To be continued next month: “Thy Kingdom Come.” This article has been excerpted in part from Chuck and Nan’s new book, The Kingdom, Power and Glory. December 2010 Personal Update News Journal.